Over the past few years with home values on the rise and a hot sales market, many accidental landlords and investors decided to sell their properties. Real estate brokers that manage residential properties must be educated in the nuances and rules and regulations of property management. Many property managers also offer sales services to their clients. Let’s take a close look at the two most common ways that rental properties are sold: the home is either listed for sale by the property manager or the rental is sold by another real estate broker. When a property manager lists a home that they have managed, they oftentimes work as a scribe for the owner, and may have to remind the owner of any property conditions that the manager may know from managing the property. A property manager may have intimate knowledge of the property and in some cases their knowledge and experience with the property is greater and more detailed than that of the seller. In the case of some investors, those owners may have never even visited or seen the property. With this in mind, when it comes time to fill out the Seller’s Property Disclosure form (SPD), a property manager needs to set up a time to go over the form with the seller, and in most cases this is over the phone. The seller and property manager should go through the disclosure form line by line. The manager should share information that they have readily available, such as when the furnace was last cleaned and serviced, when a hot water heater was replaced, when a new roof was installed due to a hail claim, and any other relevant repairs or concerns that should be disclosed. Most of the information shared with the seller that is set forth on the disclosure form can be easily pulled from the owner reports. Today’s software systems for property managers allows that information to be readily available to the manager. Sellers often don’t remember all the work that was done to a property and rarely remember when it was done, as they didn’t actually coordinate or take care of the repair issues: that’s the job of their property manager. Buyers are generally not concerned about a disclosed issue, however, they feel wronged when they don’t know about something that should have or could have been disclosed by the seller. Remember if the seller doesn’t disclose it, the neighbors no doubt will! A property manager can act as the scribe for the seller when the SPD form is filled out. Many times an investor doesn’t have anything to add to the disclosure form, and in other cases when the seller had lived in the property, say 10 years ago, they might recall items such as hail storm damage or flooding, of which the property manager would not be aware. The disclosure form can then be completed by adding that the property has been a rental managed by the property manager’s company. When the owner is using a real estate broker other than the current property manager to sell the property, which oftentimes happens when the client is referred to the property manager by a traditional sales-only licensee, in that case the property manager should not be working as the scribe or helping fill out the Seller’s Property Disclosure. In these instances, the property manager should review the Owner’s Ledger and Statements and then send the owner a quick email something like : “Hey John, to help you fill out the Seller’s Property Disclosure when the time comes, don’t forget to mention that the furnace was cleaned and checked in October of last year; the basement flooded in 2013 during the 100 year flood; the sewer line is cracked as per the plumber; and the roof, gutters, exterior paint, and south facing windows were all replaced after the 2016 hail storm as per the insurance claim”. If the seller does not disclose these things that is up to them, but the property manager will have a paper trail showing what they related to the seller. We know that a seller may contract out of completing the Seller’s Property Disclosure and in many cases a buyer’s broker has stated, “I guess we won’t get a Seller’s Property Disclosure since it’s been a rental.” The buyer’s broker is always pleased when a property manager can tell them they will have any information that the manager has from managing the home and that the seller can recall. If you are listing the property and the seller decides not to fill out the Seller’s Property Disclosure, you still have an obligation to disclose adverse material facts. When acting as a property manager, there should be an obligation to guide our clients and make any and all disclosures that are possible based on the manager’s and sellers joint knowledge of the property. It is a best practice to require the seller to fill out the disclosure form. I have had more than one colleague ask me what they should do when they have knowledge of an adverse material fact for a property they managed that is being sold by another real estate broker and they suspect the seller will not disclose the information. As a property manager you have no obligation to track down the buyer of the property and tell them anything about it. However, as a licensee, if the buyer or buyer’s broker tracks you down and asks about adverse or latent defects, you are required to tell them. That doesn’t mean they get Owner’s Statements for the past 3 years, which I have had buyer’s broker request. You need to answer their questions about the property, not about the seller or past tenants. A property manager should encourage and tell their clients to disclose everything that they can think of. It is a good practice that a property manager also advise their sellers to disclose items that show property care, as well as any defects. Since the beginning of 2018, the directions for the Seller’s Property Disclosure state that the owner is to disclose “adverse material facts”, which is the same requirement we have as licensee. This brings the disclosure form more in line for both the seller’s and licensee’s obligation for disclosure. Property managers have a unique and intimate knowledge of property conditions and this needs to be taken into account when any disclosures are being completed. There is nothing wrong with disclosing everything and anything that is relative to the property; not only asked about items like “has there ever been roof damage”; but property care matters like the date the furnace was last serviced or that it was cleaned annually in October, the date the sewer line was cleaned, when any new windows were installed, and appliance servicing and condition information. I have never had a concern from a buyer over disclosing and sharing too much information. 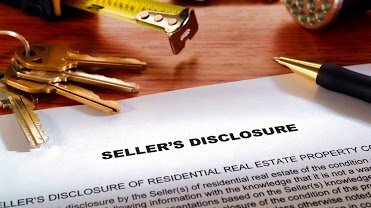 If you educate your seller regarding disclosures, and the manager and seller are on the same page, it’s always best to disclose what you can. No one wants to be dragged into a lawsuit because a buyer’s attorney alleges that the property manager has some liability when the seller fills out the Seller’s Property Disclosure. The lesson to take away is Disclose, Disclose, DISCLOSE!